For many households a kitchen knife is nothing special. Lined up next to other table ware such implements are rather unassuming and we dont think much about them until one becomes dull or breaks. At this juncture you find yourself seeking out a replacement or even perhaps an entire knife set  a task that can rapidly prove daunting. There are all types of kitchen knives on the market, and there no all-in-one type knife fits all kitchen tasks. So, before heading to the local cutlery store or shopping for a high quality kitchen knife online pause for a moment to learn about knives, their materials, construction, and determine which tools suit your lifestyle and culinary needs. Household knives come in various media. It seems like every cook has a favorite for any number of reasons. Here is a brief list of the different manufacturing materials available. Carbon steel makes a very affordable choice. Carbon steel knives hold an edge very well and offer ease in sharpening. The main drawback with this material is that it can rust. To avoid stains or rusting treat make sure its thoroughly clean and dry after each use and periodically lubricate it. Over time these knives patina, deterring corrosion. When you first use a carbon steel blade you may notice a slightly metallic taste in acidic foods. This is perfectly normal and disappears eventually. A ceramic kitchen knife very rarely requires sharpening and they do not rust like carbon steel. Chefs often favor ceramic particularly for restaurant food preparation. The blade is light weight, making fast work of dicing, mincing, slicing and chopping. A well made ceramic knife also has wonderful balance and lasts a very long time. Think of Laminate blades like a sandwich. Layers of tougher steel thats a little more durable protect hard steel (prone to chipping). Laminate blades can take a finer edge than hard steel and retain that edge for a longer time. In looking at stainless steel knives be watchful. Traditional stainless knives are made with 420 stainless, which is softer than carbon steel. That means despite the word stainless these blades can stain and theyll need frequent sharpening. A better option is seeking out high carbon stainless steel knives. This gives you a great edge that wont stain and holds an edge for a long time. Better still, these dont cost as much as standard stainless steel. People use plastic knives when they want to avoid discoloring vegetables or fruits. Some plastic knives are self-sharpening, meaning they can cause minor cuts and scratches. Titanium is a flexible metal that doesnt ware as well as some, and it also doesnt take a good edge. While these are expensive, its a poor choice in kitchen cutlery. There are two ways of manufacturing knives, forging and stamping. Forged blades go through several steps to reach completion. They begin as solid metal thats heated, pounded, and tempered into the desired level of hardness. After tempering, the blade receives sharpening and a polish. The result is typically a heftier kitchen knife thats thicker than stamped blades. A stamped blade comes from cold-rolled steel. This gets heated to improve strength, followed by grinding, sharpening and polishing. Most Chefs dont like stamped blades. If a blade doesnt have a bolster (a metal portion that joints the handle and blade together) its likely a stamped blade. Kitchen knives feature different types of edges. Part of this comes from the grinding process. Flat ground blades taper from a thin sharp edge to a thicker back, looking a bit triangular in cross section. Making it handy for cutting and chopping. Hollow ground blades exhibit beveled edges toward he middle of the blade, rather than the spine like flat ground blades. Of the two hollow ground knives are more cost-effective but not great at slicing. One side of a chisel ground blade has an edge that looks like a chisel, and the other side remains flat. This isnt a very common type of grind in household knives. This blade rounds outward and can bee seen on kitchen cleavers, ideal for cutting up thick pieces of meat or through bones. The edge of a serrated knife looks either saw-like or wavy. This creates more cutting surface to go through items that have hard exteriors and soft interiors smoothly (tomatoes being a prime example). When you buy a serrated knife remember that if it dulls youll need a professionals help to bring back the sharpness. If you buy a better quality serrated knife , it may never need sharpening. As the name implies this knife is straight along the cutting edge, without any serration or indentations. Use a straight edge for cutting vegetables, fruit and meat. These blades have a wider base at the handle then slowly decrease in size to the tip. These come from one piece of metal ground smooth. This creates a very stable blade ideal for chopping and slicing. Just like the variety in grinds, edges and handles, each kitchen knife has a distinct purpose in its design. Perhaps the most treasured knife in many cooks kitchen is a French knife, better known as a Chefs knife. This is as close to an all purpose knife as youll find, thanks to a curve of the blade that provides precision. It is most often used in a rocking method to dice, mince, and chop herbs and vegetables. The average chef knife is 8 long, but some go up to 12, making them useful for chopping. Chef knives can be expensive. But you don't have to spend a lot of money for a good knife. We found one of the best selling chef's knife, a Victorinox, at Amazon that list around $40.00 but is often on sale for less. Long like a Chefs knife but thinner, carving knives range between 8-15 inches. As the name implies, carving knifes slice precise cuts of meat. Slicing knives work similarly but theyre a little longer and thinner than your average carving knife. On the smaller side youll find paring knives. These 2-4 knives have a normal edge blade that can be used for seeding, peeling and intricate cutting. When choosing a paring knife, find one that fits your hand since you will be using this knife often in the kitchen. Butter knives are also small, and feature a dull edge perfect for spreading. Most often you see these as part of tableware rather than kitchen knife sets. A third smallish knife is a boning knife used for removing bones from meat. This 5-6 blade offers flexibility so it can get into tiny spaces, particularly in fish and poultry while a stiffer boning knife can be used on pork and beef. In the 6-11 inch category we find bread knives. These feature serrations that makes it easy to slice through pasteries, breads or any food with a soft interior and crusty outside. Cleavers also come in this size, although most in-home cleavers are only about 6. These function for splitting bones and removing large chunks of meat or fish. 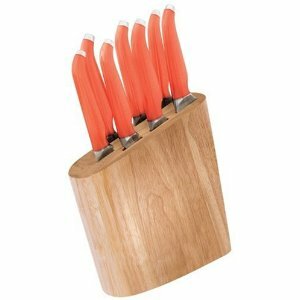 Fillet knives range from 6-11 too and are specifically use for fish preparation. As you can see, theres a lot of detail to consider in buying one kitchen knife or a whole set. Take your time. Read the consumer reviews regarding their experiences with knives youre considering. Remember that kitchen cutlery represents an investment. If you love to cook, youll want a good set of knives. Even if youre not much of a chef, a nice set of kitchen knives can last you a lifetime and even become keepsakes.